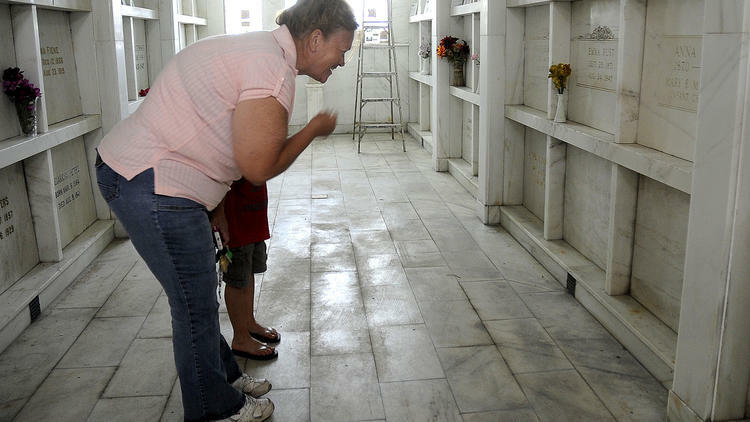 Glimmer of hope for decaying Beecher Mausoleum? As Katie Ferrari of Lisle measures the interior of one of the few unoccupied crypts at the historic Beecher Mausoleum, she’s keenly aware she’s working alongside the dead. The architecture student from the University of Illinois at Urbana-Champaign is helping record the history of this deteriorating national landmark deep in Will County, about 40 miles from Chicago. University of Illinois students visit the Beecher Mausoleum in an attempt to preserve the building which was on the 2013 list for the ‘Ten Most Endangered Historic Places’ in Illinois. She is among a half-dozen or so U. of I. architecture students spending several Saturdays this fall crafting field notes and sketches of the mausoleum, recordings they plan to submit to the Library of Congress for posterity. When founders dedicated the Beecher Mausoleum in 1914, they believed they were erecting a house for the dead that would endure. Yet like so many mausoleums across the country, the structure is falling to ruin. The Beecher Mausoleum was named to the National Register of Historic Places in September 2013 — just a few months after state preservationists declared it among the most threatened historic sites in Illinois. The Tribune wrote about the structure’s plight in December, and its condition remains largely unchanged today: The once vibrant stained-glass windows are missing. The Bedford limestone veneer is marred by cracks and crumbles. Some of the crypts were desecrated by vandals. Sandra Thielman, of Wonder Lake, in northern McHenry County, a descendant of the mausoleum’s co-founder, has made it her mission to restore the once-hallowed ground of her ancestors and other local folk. 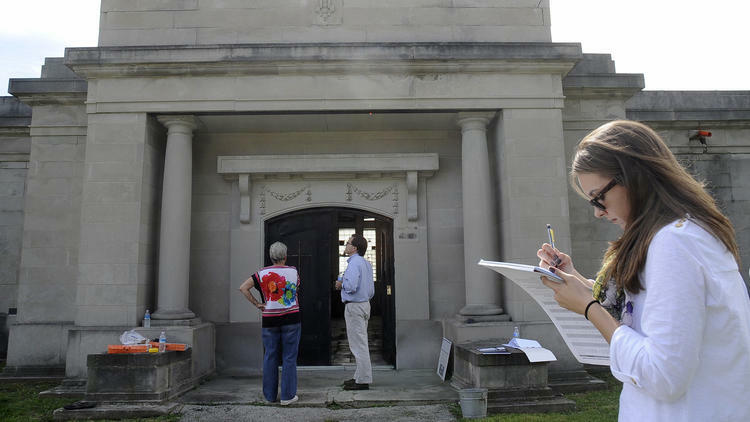 She believes she’s hit a turning point: In February, the nonprofit Landmarks Illinois awarded the mausoleum a $1,500 grant to help repair the roof, and several local labor unions also agreed to donate their time and materials, though construction is still pending. 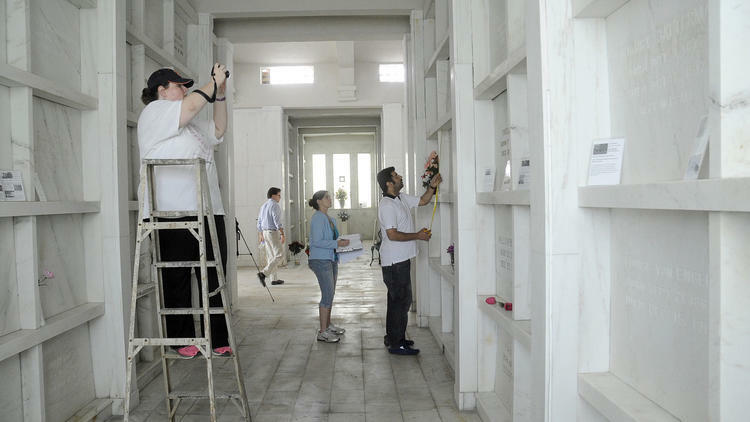 Thielman has spent the past two decades collecting documents on the mausoleum and researching the lives of the 173 souls interred there, everyone from a Civil War veteran who served as a bodyguard to President Abraham Lincoln, to doctors and mayors and town paupers. But she said any historical drawings of the building were lost years ago. The work of the architecture students will fill that void — potentially saving Thielman thousands of dollars had she paid for drawings out of pocket. 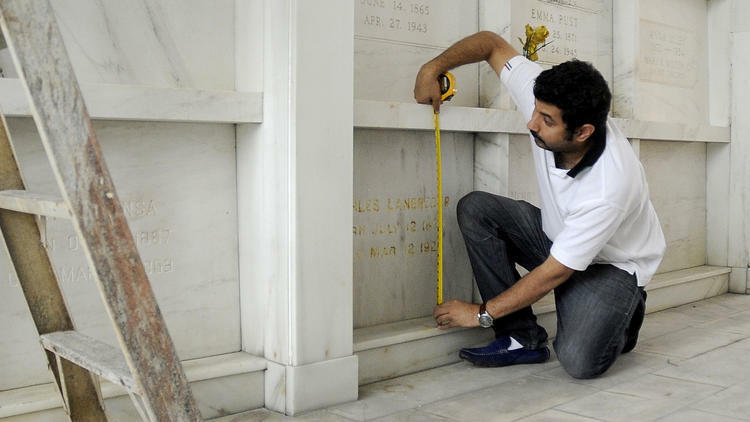 As the students comb through the nooks and crannies of the mausoleum, they’re also on the lookout for a time capsule alluded to in local newspaper clippings from 1913, but yet to be recovered. Associate professor of architecture Paul Kapp said the project gives his students real-world field experience in recording a historical building in jeopardy. Previous class work on the Illinois Supreme Court Building in Springfield has been recorded in the Library of Congress as well. Kapp, also a member of the Illinois Historic Sites Advisory Council, lamented the particular quandary of historical burial sites. Mausoleums — in contrast to cemeteries — have the added burden of a building to maintain. Once likened to the pyramids of Egypt and the Taj Mahal, many of these structures now dot Illinois in varying states of disarray. Bodies have already been disinterred at the decaying Sunset Lawn Mausoleum in Harrisburg in southern Illinois and the all-but-abandoned Fernwood Mausoleum in Roodhouse, southwest of Springfield. Former owners of the American Mausoleum in Peoria filed for bankruptcy and left the building in disrepair about six years ago, until the county state’s attorney’s office took over and renovated it. As the students worked, Sharon Krause-Earl of Steger and her 8-year-old grandson, Brandon, came to pay their respects. Krause-Earl recently learned that her great-grandmother Mary Wilkening was buried at the Beecher Mausoleum in 1927 after she died in a fall down a flight of stairs. They were elated to find her crypt inside. “I’m reconnecting with my family,” Krause-Earl said. 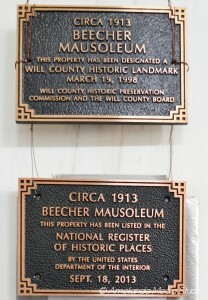 As for Thielman, saving the Beecher Mausoleum will also preserve her final resting place. Her mother, grandmother and other family members are entombed there, and she wishes to join them. And after decades of research, she believes she’s come to know many of the other men, women and children in the mausoleum’s crypts. She wants to spend eternity alongside them, too. “When I do come to those pearly gates, it’s going to be one hell of a party,” she said.